Nanofiltration processes are finding wide applications in several 'wet' industries, such as water/wastewater treatment, water re-use, textile industry, diary industry, food industry and the pulp and paper industries. Despite this, no definitive book exists which covers the principles of the techniques and their potential and actual applications.
' 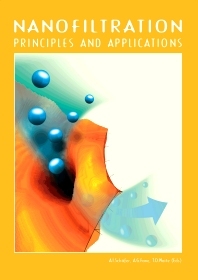 Nanofiltration: Principles and Applications ' is edited by three well-known specialists from Australia, and contains chapters from top international authorities. The result is a comprehensive and up to date account which will be essential reading for membrane designers, manufacturers and end-users worldwide. Water engineers; membrane designers and manufacturers; end users of membranes in the food, beverage, textile, paper, waste water and potable water industries. Chapter 1 Introduction; Chapter 2 History of nanofiltration membranes 1960 to 1990; Chapter 3 Nanofiltration membrane materials and preparation; Chapter 4 Module design and operation; Chapter 5 Membrane characterization; Chapter 6 Modelling the performance of Nanofiltration; membranes; Chapter 7 Chemical speciation effects in Nanofiltration separation; Chapter 8 Fouling in Nanofiltration; Chapter 9 Pretreatment and hybrid processes; Chapter 10 Water treatment; Chapter 11 Water reclamation, remediation and cleaner production with Nanofiltration; Chapter 12 Nanofiltration in the food industry; Chapter 13 Nanofiltration in the chemical processing industry; Chapter 14 Nanofiltration in the pulp and paper industry; Chapter 15 Nanofiltration of textile dye effluent; Chapter 16 Nanofiltration of landfill leachates treatment; Chapter 17 Nanofiltration bioreactors; Chapter 18 Photocatalytic nanofiltration reactors; Chapter 19 Nanofiltration in metal and acid recovery; Chapter 20 Trace contaminant removal with Nanofiltration; Chapter 21 Non–aqueous applications of Nanofiltration; Chapter 22 Conclusion; Index.